Big Tree Self Storage | Self Storage Services Inc. Many of our customers come to us because they’re looking for a clean and convenient place, but are also on a tight budget. Are you in the same situation? Maybe you’re a student at Seminole State College or University of Central Florida. Whether you’re planning a move to a new home, spending a semester abroad in the spring, or keeping your stuff safe over winter break, you’re sure to benefit from our great prices. Our temperature-controlled storage units are perfect for storing golf equipment, outdoor recreational gear or extra household belongings in a secure way. Our self storage facility is located in the heart of Florida, right next to Big Tree Park and just a short drive away from the Orlando Metro Area. Our professional manager lives here, so you can be sure someone is always on site to deal with any problems that may arise quickly at all hours. What’s more, our facility is equipped with video surveillance, 24-hour access, 24-hour kiosk, online bill pay, and other useful amenities. Call us today or come by and visit us so we can talk about your self storage needs! 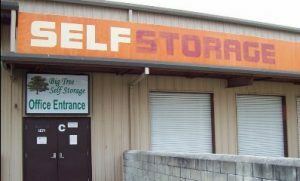 Big Tree Self Storage is located on Fleet Financial Court, just across the street from Russell's Paint & Body, allowing us to serve the communities of Longwood, Sanford, Casselberry, Winter Springs, Lake Mary, Altamonte Springs, and Maitland, FL. We’re close to Highway 17, so come by and visit us!